Ten years ago, the city of Quito implemented a $21,000 program designed to preserve upland water supplies by getting downstream water users to pay indigenous people to act as guardians of the watershed. Today, FONAG is a multi-million-dollar program with a history of results and scores of imitators. 7 June 2012 | As indigenous farmers work the windy plains above the Ecuadoran capital of Quito, they slowly alter the Andean creeks and rivers that sustain more than two million people and scores of industries downstream. It’s a conflict that plays out across Latin America and, indeed, the world, as interconnected but disparate upstream and downstream economies compete for resources. To resolve that conflict, a consortium of non-governmental organizations (NGO) and international donors set up the Fondo para la Proteccií³n del Agua (FONAG, or “Fund for the Protection of Water”) in 2000. 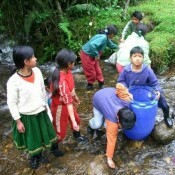 Also known as the Quito Water Fund, FONAG established itself as the first successful water fund to focus on providing drinkable water while protecting its water source, and is based on the premise that it’s more efficient to institute payments from downstream users of clean water to upstream providers than it is to impose a tax that blends with public coffers. Specifically, stakeholders – including water utilities and industries that rely on clean water – voluntarily contributed relatively small investments into a trust fund, which became the financial basis for the FONAG water fund. The funds go to education for indigenous people in the highlands, who agree to adopt more sustainable but less lucrative agricultural policies. Now, just over a decade later, FONAG has been replicated throughout the region and generated interest throughout the world. Nearly a dozen new water funds have been or are in the process of being created, said Jim Rieger, program director for The Nature Conservancy (TNC), one of the NGOs that spearheaded FONAG’s development. All told, 32 water funds are expected to be completed within the next three years. Protecting land and water in a developing country does not come cheap. Downstream water users such as water companies invest heavily to lay pipes, dig aqueducts and build water treatment plants – whatever it takes to purify water downstream. Meanwhile, Ecuadorian nature preserves allow indigenous farmers and others to live and work in them – activities that often damage the land. That damage began to impact the bottom line of companies across the watershed, says Marta Echavarria, Project Director for environmental NGO EcoDecision and the person many credit with getting FONAG off the ground by persuading corporations and individuals that they could leverage public and private funds to save money and produce more effective results. FONAG achieves this by educating upstream landowners on ways to improve their livelihoods while, at the same time, protecting the Quito watershed. It implemented five programs that include strengthening control and reforesting protected areas that naturally filter water supplies, improving hydrology and providing training and environmental education for farmers uphill and users downstream. For water trust funds to work, two significant constituents have to be satisfied. Clearly the trust funds offered a boon for business. But they could only succeed if those upstream who were responsible for protecting the land and its water quality signed on as well. In FONAG’s case this meant convincing indigenous farmers and ranchers, whose ways had been passed down from father to son, that they would also benefit. Changing their mindset was not easy. Generations of indigenous farmers had allowed their cattle to wander freely. Farmland and forests, as a result, became overgrazed and denuded of vegetation. When heavy rainfalls beat against the ground, cow dung and other waste poured downhill, contaminating water downstream. This comes at a high cost for water utilities downstream that depend on clean water. It also cost the uphill farmers money. For example, Rieger said, when distributors came to purchase livestock, farmers spent days searching through fields and mountains to find their cattle. By then the animals lost weight searching for food on overgrazed land. When farmers finally found their undernourished cattle, distributors could buy them at cut-rate costs. Now, thanks to FONAG-funded outreach efforts, farmers are taught how to improve grazing methods. They receive training in crop and cattle rotation to prevent overgrazing. Cattle gain weight and farmers no longer need to search for them. When distributors come to town, farmers can charge higher prices for their well-fed cattle. The origins of FONAG trace back to the 1990s and the “Parks in Peril” (PIP) program, a partnership between a number of NGOs and government agencies, particularly The Nature Conservancy and US AID for International Development. Participants brainstormed about how they could protect imperiled ecosystems, communities and species in Latin America and the Caribbean. Their priorities included improving ecology on what were often referred to as “paper” parks, land identified as parkland that had become so exploited that the parks often existed on paper only. Priorities also included protecting endangered plants and animals that roamed these parks and, in turn, protecting water systems. The inspiration for water trusts evolved from here. FONAG began with $21,000 in seed money. By 2010 contributions from industries and NGOs rose to nearly $1 million per year, according to FONAG statistics. Interest earned from these FONAG funds protect 5,420 km2 (2,093 square miles) of water basins, approximately the size of the U.S. state of Delaware or the Latin American country, Trinidad and Tobago. They supply water to the Metropolitan District of Quito and surrounding areas with a private endowment fund that has a planned life of 80 years. All major downstream users now support the fund including Quito’s water and electric companies, the local brewery, Cerveceria National, and the bottled water company, Tesalia Springs. FONAG’s success can be attributed to its ability to provide a transparent method to channel resources to upstream farmers from downstream industries. It creates a semi-independent body that manages money in a sequestered fund. It provides a sustainable funding mechanism that produces long-term financing. It depends on a multi-stakeholder partnership between farmers, landowners and private water users. It provides concrete conservation actions that generate services and conservation benefits. And it provides accountability to ensure delivery of services and protection of natural ecosystems. FONAG’s goal was simple: to protect reserves and their ability to provide clean water for the nearly two million people living in Quito. Its method, however, was novel. Instead of spending money to restore reserves and water quality after they were damaged, it relied on a financial mechanism to value nature’s environmental services. Water funds are now sprouting up throughout the Northern Andes that include most of Ecuador, Colombia, Northern Venezuela and the northern tip of Peru, Rieger said. Meanwhile, The Nature Conservancy recently kicked off a new initiative, the Water Fund Platform, an ambitious goal to establish 32 water funds by 2015.